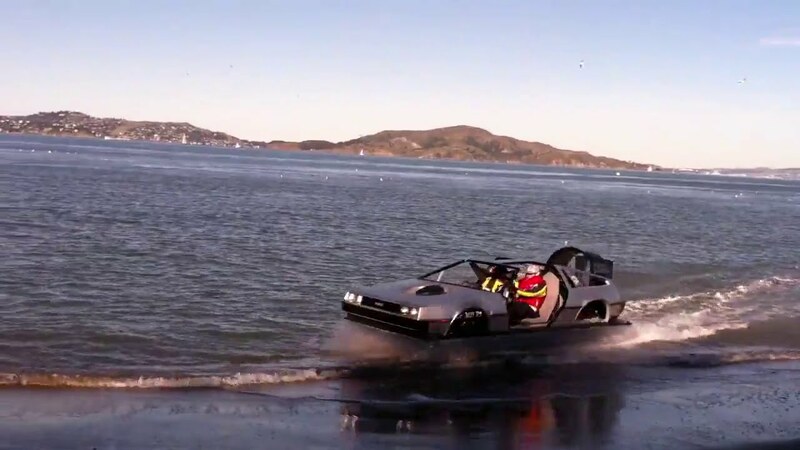 While it might not break the speed of light, a DeLorean that someone turned into a hovercraft has been attracting attention in San Francisco Bay lately. An onlooker caught a glimpse of the craft on camera recently in a video posted to Youtube. We see it cruise up the beach and do and 360 degree before heading back to land. The man apparently calls himself David Lorean and has showed up to McCovey Cove outside Giants Stadium. He built the craft with roughly $5,500 from a kickstarter campaign. In plans for the design, creator Matthew Riese reveals that he took the blueprints of a popular kit hovercaft and modified it to look like a DeLorean. After it debuted in 2012, Riese reports much trials and tribulations, in which he worked full time to pay for his habit. By 2013 he was tearing across the bay. Just a normal day in the Bay Area we suppose.